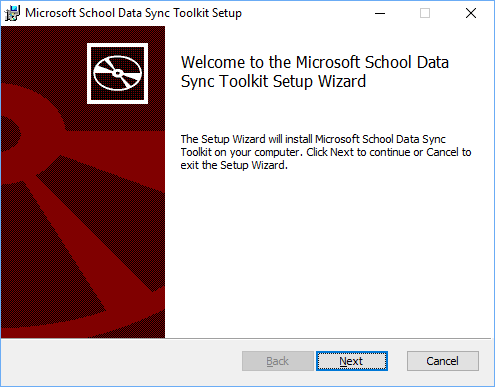 You can use the School Data Sync Toolkit to validate your CSV files and check for errors, perform a manual CSV sync from PowerShell, and automate the CSV sync process to meet your needs. Double-click the tool to run the wizard. On the Welcome page, choose Next. Accept the license agreement > click Next, choose an installation path, and then choose Next. 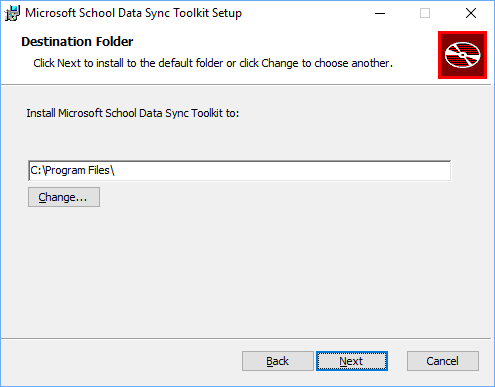 After you have installed the toolkit and your initial profile has been created in the School Data Sync Portal, you can use the following script to upload additional CSV files on a regular or as-needed basis. The installer allows you to run several cmdlets from an admin PowerShell session on your computer, to help you deploy School Data Sync successfully. See the following sections for a description and use case for each cmdlet. You will need to install a specific version of AzCopy for the file uploads to work. The link to the AZCopy installer is here. To use the toolkit to validate CSV files before you upload the files for synchronization, open PowerShell as an Administrator and use the Start-CsvFilesValidation cmdlet as described by the following syntax and examples. Use the Start-CsvFilesValidation cmdlet to validate CSV files for a given sync profile. Path to the folder containing the CSV files. Name of the profile you've created in School Data Sync for the CSVs you want to validate. User name of the admin account with Global admin rights for the Office 365 tenant. The following example performs client-side validation of CSV files located in the c:\temp directory of the local computer, for a profile called "School 1", using the global admin account of admin@contoso.com. To upload and sync CSV files with School Data Sync, open PowerShell as an Administrator and use the Send-CsvFiles cmdlet as described by the following syntax and example. Use the Send-CsvFiles cmdlet to upload and sync CSV files for a given sync profile. The following example uploads and syncs a set of CSV files located in the c:\temp directory of the local computer, for a profile called "School 1", using the global admin account of "admin@contoso.com. Send-CsvFiles -CsvFolderPath "c:\\temp" -ProfileName "School 1" -UserName "admin@contoso.com"
You can schedule unattended automated syncs between your CSV files stored locally and your SDS Sync Profile in Office 365. To do this, open PowerShell as an Administrator and use the Add-CsvFileSyncTask cmdlet as described by the following syntax and examples. After the scheduled task is complete, you can monitor the progress and history of these automated syncs by reviewing the newly created scheduled task in Task Scheduler. This scheduled task will run daily at midnight, unless you modify the start time using the parameter below. When you run this command, you will be prompted to authenticate. The first authentication prompt will require your Global Admin credentials and will already contain the username you specify in the command below, under the username parameter. After you enter your password and click Enter, you will then receive a second, basic authentication prompt. Here you should enter the local administrator username and password, which will be the credentials used to run the scheduled task, each time it starts daily. If you include the StoreCredentials parameter, the local administrator account credentials will be stored in Credential Manager, and continue to work as long as the password remains unchanged. If you do not specify the StoreCredentials parameter, you will be granted an auth token, which has a maximum lifetime of 90 days. This will require that you run the command again after the auth token expires and is no longer able to authenticate while running the scheduled task. Use the Add-CsvFileSyncTask cmdlet to upload and sync CSV files for a given sync profile. Path to the folder containing the CSV files that will be regularly synced. Name of the SDS Sync Profile you are syncing the CSV Files against. UserPrincipalName of the Global Admin Account to be used with SDS. Path to the directory where you would like to store your validation log files. Will allow the output of the validate parameter to be written out to the specified directory. This is required if you want to review the results of the validate parameter. Run the validation task prior to each sync. Creates a file in the Logpath directory if the RedirectOutput parameter is also included. Username of the local administrator on the system. Time of day the scheduled task will begin. Creates an entry in Credential Manager to run the scheduled task. The credential remains valid and continues to work, unless the password associated with this account expires. The following example creates an automated sync scheduled task for CSV files located in the C:\temp folder, on a sync profile called SDSSync, creates validation log files in the C:\temp\logs folder, and sets the C:\temp\SDS\Logs directory as the location for all log files generated. This command also runs the validation process for the CSVs before the sync begins and saves the validation output in the same c:\temp\logs directory. You can use the Toolkit to convert OneRoster CSV Files and sync them with School Data Sync. To do this, open PowerShell as an Administrator and use the Convert-OneRosterToMicrosoftSDS cmdlet as described by the following syntax and example. After the conversion is complete, you can then sync those CSV files through SDS, following our standard CSV sync guidance. Use the Convert-OneRosterToMicrosoftSDS cmdlet to upload and sync CSV files for a given sync profile. Path to the folder containing the CSV files exported from OneRoster. Path to the folder where the converted CSV files will be created. Path to the folder where you want logging stored on these actions. The following example converts a set of OneRoster CSV files located in the C:\temp\OneRoster folder, creates a new set of CSV files located in the C:\temp\SDS directory of the local computer, and sets the C:\temp\SDS\Logs directory as the location for all log files generated. Convert-OneRosterToMicrosoftSDS -OneRosterFolderPath "C:\\temp\\OneRoster" -SDSFolderPath "C:\\temp\\SDS" -LogPath "C:\\temp\\SDS\\logs"
To use the toolkit to validate CSV files after you upload and sync a set of CSV files, open PowerShell as an Administrator and use the Compare-DirectoryToCSVFiles cmdlet as described by the following syntax and examples. Use the Compare-DirectoryToCSVFiles cmdlet to validate CSV files for a given sync profile. The following example performs client side validation of CSV files located in the c:\temp directory of the local computer, for a profile called "School 1", using the global admin account of "admin@contoso.com". Compare-DirectoryToCsvFiles -CsvFolderPath "c:\\temp" -ProfileName "School 1" -UserName "admin@contoso.com"
Step 1. Delete the task in task scheduler. Step 3. If errors occur, please download the newest AZCopy from here. Step 4. Attempt to run the above command again. Step 5. After the command runs, go to the Task Scheduler and open the task and verify within the logs.